This chapter starts with some leases, deals with Edward’s will and death, and ends with the 1762 document from which so much information has been gathered and which gives an insight into the personalities of these early Bomfords. Edward, the fourth son of Colonel Laurence Bomford (1.6), was the mystery Bomford about whom Burke recorded little. He was left no property by his father, which seems strange, but he lived at Hightown and took over the Westmeath land of his oldest brother Thomas. As will be seen in this chapter Thomas harassed him over money matters, and yet he appears to be a hard worker who improved the Westmeath property. His only son, John, died before he did which left him with three daughters (2.22), two of whom were listed incorrectly in Burke and the third one was omitted. For various reasons I feel sorry for Edward. He appears to be isolated from the rest of the family and his land had to be sold to pay for Thomas’ debts. Although he leased the land again he seemed to lose heart, perhaps because his only son died or perhaps because he was never a strong character. As has been mentioned elsewhere, the maps of the 1600s were not very accurate, and so in these more stable times much surveying was carried out throughout the country whenever convenient. We have three of these maps: this one of Hightown (below); one of Oakley Park surveyed about the same time; and one of Ross and Thorntown. When Thomas died in 1740 (5.7), Hightown or Balloughter was sold to Mark Whyte to help pay off Thomas’ debts. Edward had lived at Hightown since about 1720 and he leased the land from Thomas. When the land was sold he leased it from Mark Whyte, but only 898 statute acres out of the original 1,011. Total: 554 acres. 554 plantation acres is 898 statute. Edward had made a number of improvements to the land; he dug drains around the bogs “to keep cattle from going on the bog”, and improved the ‘mountain’ pasture, which was probably covered in gorse and scrub under-growth. The next lease of 1750 has the proviso that he “expends £80 to complete the building of the house and offices which he had begun”. Whether this was a new Hightown House is not known and it is a pity that Edward’s house is not shown on the map. However an early 1800s map, printed before the 1836 survey, does show ‘Heathstown House’ which may be the house Edward had to complete and, indeed, it is possible the ‘Heathstown’ is a misprint for ‘Hightown’. The fact that the proviso had to be written in to the deed is an indication that Edward had started the building some years before and had suspended operations; perhaps because of the uncertainty of his future but also perhaps because he had lost the will to continue since his son had died and he had no-one to pass the place on to. Two of the three bogs are still there, and a new main road from Killucan to the Pass of Kilbride has been built across the southern portion of the land. The north-south road was and still is in existence; the Hill of Hightown and the three detached bogs lie to the west of the road, and the Pasture and Mountain lie to the east. The map was used in 1793 when there was a dispute over one of the bogs (15.11), and the area of the dispute has been shaded on the map in red. or for 41 years at a rent of £200; with the proviso that within seven years Edward Bumford expends £80 to complete the building of the house and offices which he has begun. Although this deed is dated 1750, it must have been signed after Edward’s death in 1756, since Margaret signed it as his widow. This is also indicated by the serial numbers of the Registry of Deeds, in February 1750 the numbers are around 98,000 and in late 1756 they are around 122,000. The later date may also account for the increase of £50 in the rent. Endorsement on the back of the deed dated 7th June 1756 in which Edward leased the land to Thomas Fetherston of Cushionstown. At 8/- an acre, £226.14.0 works out at 567 plantation acres. So Oldtown and Enniscoffey contain about 908 statute acres. Edward must have died before 20th July 1756 for Margaret to sign as his executor. He was alive to sign the deed of 2nd April 1756 and may have signed the deed of 7th June (both in 10.3). Thus Edward died between April and July, but more likely in June or July 1756. Between Margaret Bomford of Hightown, widow and executor of Edward Bomford deceased and Edward Sandys of the City of Dublin,linen draper and executor to Patrick Sandys deceased. There is no record of Edward raising a mortgage from Sandys, either the father or the son, but no doubt this is what happened. Patrick Sandys is of Cookestown, Co Dublin, in some deeds and in others of the same period is a merchant of King Street, Oxmanstown, Dublin. Thomas Bomford in his will of 1738 describes him as his ‘kindest friend’, makes him an executor and bequeaths him the lease of Boycetown and ‘what cattle there shall be thereon’. He is first mentioned in June 1737 when he witnessed the lease of Boycetown but it is as Thomas’ executor that he appears mostly. In February 1750 William Sandys, the only son of Patrick, is made a ‘life’ of Hightown. Patrick died just before 1756 and his executor was Edward Sandys, a linen draper in Dublin. Another Sandys mentioned in the deeds is Rev Michael Sandys (1717 - 1778) who carried out the marriage ceremony of William Bomford, eldest son of Thomas of Clounstown, and Charity Ryder in 1754. At this date he was ‘Vicar Choral’ at St Patrick’s Cathedral. On 19th November 1742 he married Anne Ryder (c1722-1764), elder sister to Charity Ryder. So there, were four Sandys in the deeds, Patrick and his only son William of Cookestown, Edward the linen draper, and the Rev Michael of St Patrick’s Cathedral. It is thought that they are related and, except for the son William, probably brothers, and that Patrick and Edward together may have run the linen drapery business. Reciting that on 30th December 1751 (missing) Edward Bomford late of Hightown deceased leased to Mathew Skelly, farmer, that part of Oldtown known as Leagatoor containing 92 plantation acres (149 statute) for 31 years from May 1750 at a rent of. £64.8.0. There are three other entries in the Index to Prerogative Wills but none give a definite probate date, just 1756. The Index of Prerogative Grants has 1756 #155:163, Will. I tried to make ‘dinvs’ into ‘daurs’ and indeed it might be, but it is not really clear. We have already proved that “Catherine wife of Antony Hamilton” is a daughter of Edward, so also is Anne Molloy. The question that now arises; can we claim that ‘Lucy’ was also a daughter? From the age point of view it is improbable that she was a daughter of Colonel Laurence; she does not marry Thomas Birmingham until about 1760 so the bald entry in the will of just ‘Lucy’ would be correct. For these reasons I have removed her as one of Laurence’s children and placed her as a daughter of Edward. Margaret was one executor; the other according to the 1762 brief was William Bomford of Clounstown, the eldest son of Thomas of Cushenstown and later of Clounstown. The 1912 Edition of Burke, under Molloy, states that Anne Molloy was a co-heir of Edward and was left property in Westmeath. Vicars Index only lists people, not land, but there are other clues as to what happened to Edward’s land. 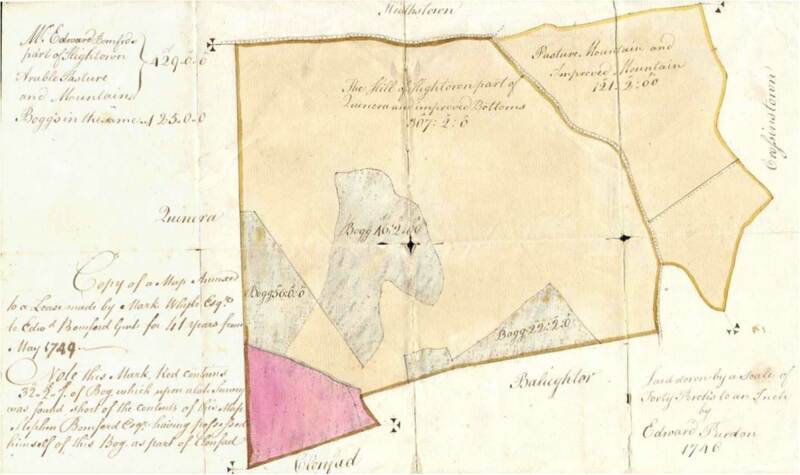 Hightown or Balloughter was mentioned in the marriage settlement of Catherine and Antony Hamilton (8.1) and is not mentioned after 1755 in the Bomford leases. It looks as though Catherine was also a co-heir and that Hightown went to her. In 1854 all this land belonged to the Dopping and Tuthill families, so the Hamiltons must have sold it before then. Clonfad and Rattin remained in Bomford hands until the early 1900s so could not have been left to any of Edward’s daughters who all married. These places went to Stephen the younger of Rahinstown. Enniscoffey and Old town. Some, if not all, must have been bequeathed to the daughter Anne (Molloy) (8.9.1). The 1854 valuation (27.3) shows Daniel Molloy, Anne’s grandson, in possession of most of Enniscoffey. There is no mention of it after 1762 concerning the Bomfords. The youngest daughter, Lucy, did not marry until after Edward’s death (8.12), and so, probably, was left no land by Edward; but, even if she was, it was sold before the 1854 valuation, which makes no mention of the name Birmingham. It is unlikely that the land would be handed over before Edward’s wife Margaret died; she would have been granted in the will or in her marriage settlement an income from the land until her death. Her will was dated 5th November 1763 so it was most likely in 1764 that the properties of Hightown, Enniscoffey and Oldtown left Bomford hands. Edward of Hightown, Co Westmeath, fourth son of Colonel Laurence Bomford, born c1660 (1.6), married 1715 or 1716 Margaret Charlton(2.13.1). He died June or July 1756 and she died c1764 (will 5th November 1763). They had four children. 1. John b c 1718 (2.22) died unmarried between August 1738 and February 1740.
a. James Edward Hamilton of Kilnacarra, born 1743.
b. Sidney (girl) born c 1745.
c. Antony Hamilton born c 1748.
d. John Hamilton born c 1751.
e. Margaret Hamilton, born c 1753. Married John Earl. (All minors until at least 1763). a. Edward Daly of Mornington, born c1746, married 1779 Miss Clarke, daughter of John Clarke of Rath, King’s Co. He died 1817 having had three sons and two daughers (8.3). b. Laurence Bomford Molloy of Clonbela, born 1760, married 22nd February 1788 Elizabeth, second daughter of Rev John Mulock, DD, Bellair, King’s Co, by his second wife Anne, daughter and heir of Richard Homan of Moate. He died 31st May 1805 and she in 1804 having had three boys and one girl. The 4th son took the name Homan-Mulock (see 8.9.1). c. Daniel Molloy, born c1763 had at least one daughter Anne Bomford Molloy married Francis Hugh Massy of Suir Castle, Co Tipperary, c1820 (15.5.1). 4. Lucy married between 1758 and 1766 Thomas Birmingham (8.12). Deed a. of 20th July 1692 stated that Oldtown and Enniscoffey were leased to Thomas Bomford the elder in trust by Colonel Laurence Bomford, his father, for three lives. Deed b. of 14th July 1692 stated that Oldtown and Enniscoffey were leased to Thomas Bomford for 999 years. Both these deeds are recorded under the date 20th July 1692 (see 1.9.2 for evidence of these deeds). It would seem that if the two places were only in trust for three lives then the property would revert to the senior member of the Bomford family. However if the property was leased to Thomas for 999 years then he could do whatever he chose with it. In fact Thomas’ executors sold it to Mark Whyte to pay his debts. Mark Whyte then leased it back to Edward for 41 years. But this has nothing to do with the main issue. What is important is the family history disclosed in the brief, and not the technicalities of the land. About six years before his father’s death in 1720, his father Laurence was too old to transact business, so his lands were divided up amongst the sons. Oldtown and Enniscoffey were looked after by Edward who paid the tithes (£6) and the Quit Rent. Even the cattle were branded with Edward’s brand and, in fact, he ran these farms without any dispute for the rest of his life. When Edward died in 1756 Stephen the elder, Edward’s younger brother and the only remaining son of Laurence, claimed Oldtown and Enniscoffey. When Stephen the elder died in 1759 these two places passed to his son, Stephen the younger. However Stephen the elder’s will “contained some words which shewed a consiousness of the right and title of Edward to the lands of Oldtown and Enniscoffey which tended to injure and affect the claim”. This argument relied on Deed (a) and that Deed (b) never existed. Thomas owned the land but he let his father and then Edward manage it. Thomas mortgaged Oldtown and Enniscoffey with Edward’s knowledge. If the land belonged to Edward he would not have allowed Thomas to mortgage it. Thomas the elder died in 1740 leaving his property to his nephew, Thomas the younger. Thomas the younger died intestate the following year, in 1741, and the property reverted to his next of kin, his father Stephen the elder. Stephen died in 1759 and the property passed to his son, Stephen the younger. This argument relied on Deed (b) and that Deed (a) never existed. The legal arguments of Thomas and Edward appear pointless since at this date (1762) Stephen the younger had inherited both properties and would have done so regardless of through whom the property had been passed. Therefore, although the brief does not say so, the main object must really have been between the participants. Although not mentioned by Vicars, Edward Bomford named Richard Fetherston in his will and he may have been an executor. Richard lived at Grangemore in the Parish of Killucan and which Lewis described in 1838 as ‘a handsome house in a well planted demesne’. His reasons for claiming these farms is not made clear in this document, as the brief only puts forward the Bomford arguments. This is a great pity, as we do not know how Richard Fetherston appeared on the scene. I failed to find any record of this case in the Public Record Office but it may be recorded under the name ‘Fetherston’ which remains to be investigated. The Fetherston family tree will be found in paragraph 10.7. The Findings of Lord Bowes, the Lord Chancellor, are not known. Oldtown and Enniscoffey do not figure again in the Bomford documents, except that Stephen the younger tries to reclaim the property in 1801. Thus, we can assume that the case went in favour of Edward Bomford since his daughters were his co-heirs and at least one daughter, Anne, brought Westmeath property into the Molloy family at, or after, her marriage to John Molloy. The 1854 valuation shows that her grandson, Daniel Molloy, owned much of Enniscoffey. It certainly appears to be the intention of the 1692 deeds that Thomas should have the property on a lease of 999 years and so on the face of it the land should have gone to Stephen. The fact that Edward got it may be an early example of “squatter’s rights” and to my mind Edward deserved it. The legal arguments in the brief are not so important, but the brief does give a most interesting insight into the Bomford personalities, and indeed of their history, which otherwise would have been lost for ever. Edward Bomford “had little or no substance of his own property and chiefly relied on Thomas his brother for support”, the document goes on to argue that this was not true but that Edward “was actually possessed in his own right of severall large and extensive ffarms well stocked with sheep and horned cattle of different sorts, and under corn of different kinds in which the said Edward Bomford very largely dealt, and frequently entrusted the sale of his cattle, corn and wool to the said Thomas Bomford when in the City of Dublin where he frequently resided for the attending the markets and several law suits and intricate accounts wherein the said Thomas and Edward were involved...”. “Thomas the elder was a man possessed of very maney ffarms and an extensive dealer, yet the said Thomas became greatly indebted to severall persons in large sums of money and that many of his creditors were so pressing upon him that he frequently had recourse to the said Edward Bomford to borrow money from him, and join him in severall securities to severall of the said Thomas Bomford’s creditors and he became at different times so distressed that he in many of his letters grievously laments the misery and writchedness of his situation occasioned by the many debts he owed and frequently not only desired the said Edward, in the most pressing manner, not only to sell corn and cattle but also lands, the property of Edward, in order to raise money to be applied towards payment of his debts…”. Indeed Edward did “furnish” Thomas “with many cattle and other plans to answer the exigencys of the said Thomas the elder’s affaires”. An example of one of Thomas’ letters is that to Richard Connell (5.5) in which he says that he is “given up by all, over run and over come with sorrow, lossis and dissapointments on all sides, ever to dispair of ever haveing ease or quiett in this life...”. The brief continues “Thomas the elder was at the same time possessed of severall valuable leases for lives and years and fee farm interests set to solvent tenants which would be of considerable yearly value over and above the rents reserved to the Head Landlords, and more than sufficient to pay off all the debts due …. Thomas being then old and not likely to have issue of his own, the said Edward had large expectations of getting a very considerable fortune upon the death of the said Thomas, as he afterwards did ….” Thomas played upon this argument in persuading Edward to pay his debts, he ‘insinuated’ and “encouraged a belief and expectation of his leaving all that he was worth” to Edward and suggested that payment of Thomas’ debts was in fact “serving himself”. An old servant of Edward, “one William Loyd”, relates that the value of “cattle, corn, wool and other matters” which Edward gave to Thomas “amounted to upwards of £7,000”. This was known by all the family, and in 1729 Stephen the elder wrote to Edward and “he indeavoured to disuade the said Edward from suffering the said Thomas, their brother, from applying his property to the use of the said Thomas”. However Thomas “did draw the said Edward into his measures that it was thought …. that their interests and concerns became inseperable and connected …. and he took upon him so much to interfare in the affaires of Edward and assume such a dominier over Edward that” he manages to muddle Edward’s creditors and debtors into believing that Edward’s affairs were in the hands of Thomas. It is with this background that Thomas was able to mortgage Oldtown and Enniscoffey. According to Stephen, Edward weakly gave in to Thomas and allowed Thomas to mortgage Edward’s land. However it must not be forgotten that Stephen was arguing a case in court to gain or re-gain a very considerable property of up to 1,000 acres, and that it was in his interest to make Thomas into an inefficient, money grabbing ogre, and Edward into a poor innocent. “5 or 6 years before the death of Laurence Bomford, the father, which happened sometime in the year 1720, Laurence provided for all his sons except Edward, and being himself very old and unable to mind business, gave up the care and management of Oldtown and Enniscoffey together with the entire stock for Edward’s sole use, in consequence whereof all the said stock were branded with Edward’s brand.” Edward continued the care of the two properties until his death and none of the family disputed his right, although Thomas interfered. To prove that Edward controlled these two places, two receipts were produced dated 8th September 1715 and 6th October 1718 for £6 signed by William Gay, each covering the tithes for one year for Oldtown and Enniscoffey; Edward also paid the Quit Rents. When Edward died in 1756 Stephen the elder claimed the land because he was the next male in line. Stephen died in 1759; his will includes Oldtown and Enniscoffey, which he passed to his 5th son, Isaac. Although Stephen’s executors “insisted that he was entitled to the interest of the 999 year lease” both Isaac and Stephen the younger “found that the said will contained some words which shewed a consiousness in the said Stephen the elder of the right and title of the said Edward Bomford to the said lands ….” However this dispute was between two Bomfords and when they were threatened from the outside they “came to some agreement privately among themselves relative to their severall pretensions and claims”. Because of this it was claimed that: the two executors of the will, John Smith and Rev John Bomford, plus Stephen the younger and Isaac, planned firstly to suppress Stephen’s will so “that the same should not be proved in common fform”, and then to “take out Letters of Administration of the goods and chattles of the said Stephen the elder as if the said Stephen the elder had died intestate”. By doing this, land would go to the next of kin (Stephen the younger) and he would parcel out the land according to the agreement “made privately among themselves, but above all those awkward words of the will would not be made public”. Indeed “Isaac Bomford who was an attorney and law agent declared before several gentlemen at Kinnegad that the reason why he was not employed as agent for Stephen his brother was that he set up a claim to the said lands under his father’s will but had dropped the same”. So the family ties held when threatened from the outside, by Richard Fetherston. Much space in the brief is given to the question of the letters of Stephen the elder. From about 1738 until his death in 1759 Stephen “was deprived of his sight”, he was blind for those 21 years. His letters were dictated, mostly to his son Thomas. The discussion concerns which letters were really dictated by Stephen and which originated from other members of the family. Indeed it is suggested that he was blind in 1729 and that a letter dated 12th October 1729 was not written by Stephen at all but originated from Thomas the younger. This was the letter which was sent to Edward in which the writer tried to dissuade Edward from allowing Thomas using his money and property. It is hard to say who comes out of this affair well. Probably only Stephen the elder who, even though blind for perhaps 30 years, still had a conscience and the strength of mind to have his thoughts placed in his will. Thomas the elder comes out badly, a meddler and a muddler. Poor Edward appears very weak but probably hard working. Stephen the younger and the others who considered suppressing the will come out badly, and yet Stephen must have felt some justification to raise the whole matter again in 1801. Many facts have come from this document, and many people are mentioned, some of whom are only mentioned here, but before listing these people it is convenient if we first cover the 1801 document so that there will be the minimum duplication and so that this case can be concluded. Stephen did not pursue the matter. According to the schedule four bills were filed, on 23rd January 1747, 21st May 1752, 31st July 1756 and the one which is recorded above dated 23rd June 1762. There were also nine amendments, the last one being dated, 17th June 1764. The one brief we have represents only a small fraction of the original papers so any conclusion drawn must be suspect. The following is a summary of those mentioned in both documents and the letters they wrote. The dates in brackets are the years when the letters were written and these dates in many cases were invaluable, if only to prove that the writers were alive that year. The order is that of the schedule (Photos 2573 - 2576). (1748, 1749) of Cookestown, Co Dublin, a merchant of Dublin. He was an executor of the will of Thomas the elder, and died in 1756 (10.3.2). (1757), linen draper of Dublin. He was an executor of Patrick Sandys (10.3.2). (1758, 1761) of Clonard, Co Kildare was the other executor of the will of Thomas the elder, and when Patrick Sandys died, the only remaining executor (5.6). (-), eldest daughter of Colonel Laurence Bomford. She married James Hyland before 1720. Elizabeth was alive in 1747 but James had died then and he may have died before 1738.
widow, (1759), daughter of Edward Bomford, who married Antony Hamilton of Kilnacarra, Co Longford, in February 1742. Antony had died in June 1755 (8.1). This 1759 letter is the last mention of Catherine in the documents. and Elizabeth his wife (1766). [Anthony Lennon married Elizabeth Bomford at Killucan on 14 July 1747 (IGI).] Paul Lennon (-) is also mentioned. (1758,1759,1760). The text records “Marg Bomford widow and relict of Edward Bomford.” Edward died in June or July 1756. Margaret’s will was dated 5th November 1763 but it is not known when she died. (1758). She was a daughter of Edward and married Thomas Birmingham. Thomas Birmingham and Lucy his wife (1766). This marriage must have taken place between the dates of these two letters, 1758 and 1766 (8.12). Nothing is known about these two. administrator of Elizabeth (Bomford) Standring (-). He was a tallow chandler of Dublin who in 1743 witnessed a lease of Rahinstown (9.1). Richard was Bishop of Waterford and Lismore (1761). They were both involved with at least one of the mortgages of Thomas the elder (6.10.7). (1761). The eldest son and heir of Thomas Bomford of Cushenstown and Clounstown. Thomas died in 1757. William married Charity Ryder in 1754 (7.17) and was an executor of the will of Edward of Hightown. (1757). An attorney in Dublin who leased the Westmeath properties of Hightown, Clonfad and Rattin to Edward in 1750 (10.2). He was also involved with the mortgages of Thomas the elder (7.4). 17. The Executors of Owen Donnot. (1758, 1759, 1760). These two are bracketed together in the schedule and are the same family. Later the family changes its name to Fetherstonhaugh. Thomas Fetherston lived at Cushionstown, just to the east of Hightown, and he leased Oldtown and Enniscoffey from Edward Bomford in 1756 (10.3). Richard Fetherston of Grangemore was “named in the last will and testament of the said Edwd Bomford”, and he filed the claim for the disputed lands. A note on the Fetherston family is at the end of this brief (10.7). Hester his wife (-). Esther, as she signed herself, was the youngest daughter of Stephen the elder of Gallow and was born in 1732. She married John Kelly of Galway and a merchant in Dublin, in 1756 (8.8). and Margaret his wife (-). There is no information on this couple. also Bomford, widow (1758). Ann was a daughter of Edward of Hightown. She married twice, 1st (husband) c1745 Owen Daly who died in 1747 (8.3). 2nd (husband) John Molloy in 1755 (8.9). She had children by both marriages. The date of the letter, 1758 is thought to be a mistake for 1748. (1757, 1766). No definite information found, but he might be a son of Terence Franklin of Dunany, Co Kildare, who died in 1759 and leased land from Thomas Bomford (6.5). Although the Bomfords had their copy of the important deed of 1692, it was considered necessary to trace the FitzGerald copy; this copy passed through the hands of these people (1.9.2). Garrett FitzGerald was the nephew and heir of Gerald FitzGerald. Gerald FitzGerald of Kilmore, Co Kildare, married in 1720 Clare, the eldest daughter of Sir John Bellew the 2nd baronet of Barmeath, Co Louth. When Gerald died in 1731 Clare married secondly Hyacinth Cheevers of St Brendans, Cregan, Co Galway, and Clare inherited the property. They had one daughter, Bridgett Cheevers “who since marryed John Fallon Esq.” of Clonagh, Co Roscommon, on 10 February 1759, and she in turn inherited the property. It was John Fallon who wrote in 1763 that he could produce the deed if necessary. He died in 1809. Incidentally the uncle of Hyacinth, Edward Cheevers, was ADC to King James II at the Battle of the Boyne and accompanied James II into exile. and Ann his wife (-). Ann Molloy was mentioned in Edward’s will and John Molloy was an administrator of it. See No. 22 above. Ann Bomford married twice and became Ann Daly and then Ann Molloy (8.9). (1757). No information, but Brett Norton was a Commissioner of Bankruptcy in 1787. (1749) of Hightown died 1756 (10.4). of Gallow (1753,1755, Feb 1756) died 1759 (9.7). of Rahinstown (1753,1757,1758,1759,1763) died 1806 (8.2). (1763,1764), the attorney (11.14), died 1793 (8.10). (-), the clergyman, died 1776 (8.7). (-), of Clounstown, son of Oliver, died 1757 (7.18). Nearly all the Bomford family has been mentioned in these documents except for Oliver’s branch who were not directly involved with the disputed lands. Of the eight members not listed six members are known to be dead. From a negative point of view it is assumed that the other two are also dead. These two are Margaret, youngest daughter of Colonel Laurence, and her husband Simon Berwick. The Berwicks had at least three boys, the oldest being about 50 in 1762. Nothing is known about their children but we cannot assume that they are dead simply because they are not listed. One cannot help wondering what is the connection with the Bomfords with three apparently unattached women: Elizabeth Friend, Elizabeth Lennon and Margaret Nicholls. Were they perhaps unknown Bomford daughters who married or married again? It is not unknown at this time to omit the names of daughters or wives; for instance none of the daughters of Stephen the younger were mentioned in Burke, some have been discovered in this investigation, but there may be others. Is it possible, for instance, that Margaret Berwick (Bomford) married secondly Simon Nicholls (21 above) or could Elizabeth Hyland (5 above) have remarried and become Elizabeth Friend or Lennon? In 1801 Stephen the younger sent copies of the following wills, which were listed in the schedule together with the date of the wills. One of the Mr Busston’s reasons why Stephen the younger could not reclaim the land was that, of all those listed who could be usefully examined, in 1801only John Molloy was alive. At one time it was thought that this family, now named Fetherstonhaugh, was in some way related to the Bomfords, perhaps through Edward of Hightown (at least one document has recorded Edward's marriage to a Fetherston, but see 2.13.1), because that might account for the litigation which went on over Oldtown and Enniscoffey. However there appears to be no direct connection, although numerous Fetherstons have appeared in the records. 2. Thomas Fetherston, a soldier who served in defence of Enniskillen and carried the Enniskillen Standard at the Battles of the Boyne (1690) and Aughrim (1691). He married and had children but his branch died out in the early 1800s. 3. Philip Fetherston married and had children but his branch also died out. b. Thomas Fetherston of Bracklyn Castle, Co Westmeath, married Mary Nugent, the only child and heir of Oliver Nugent of Derrymore. He died in 1776 and they were the ancestors of the Fetherstons of Bracklyn Castle south of Delvin. c. Richard Fetherston married Anne Ledwith. f. Margaret Fetherston married Rev Philip Reade, DD. g. Frances Fetherston married Joseph Daly of Castle Daly, Co Westmeath. It is possible that the third son, Richard, is the Richard of Grangemore mentioned in the above brief of 1762; and that the second son, Thomas of Bracklyn, is the Thomas of Cushionstown also mentioned in the brief and in the lease (10.3), but he would have to have moved to Bracklyn after 1762 (which is possible as it seems Bracklyn House was constructed c 1790). However these two [Thomas and Richard] are coupled in the brief (10.6.1 #18) and must be related, as are these two brothers [William and Francis?]. a. John Fetherston, Dean of Leighlin, died unmarried in 1764.
b. William Fetherston, of Carrick married and died 1770. He is the ancestor of the Fetherstons of Carrick. c. Francis Fetherston, Alderman of Dublin, married 1753 and died 1787.
d. Ralph Fetherston was created a Baronet in 1776 of Ardagh. In 1752 he married Elizabeth, eldest daughter of Samuel Ahmuty of Brianstown, Co Longford, and sister to Dorcas who married John Bomford the grandson of Oliver Bomford in 1766 (14.10). Elizabeth died on 19th June 1754 and Ralph remarried and died 1780. His line continues. a. Robert Fetherston of Whiterock who married Gertrude Donogher a great grand-daughter of Andrew Wilson of Piercefield. Gertrude was mentioned in the will of Laurence Bomford of 1761 and inherited some of the Wilson property in the deeds of 1754 and 1759 (7.9). 4. Rev John Fetherston died unmarried. 5. The three daughters, Elizabeth Fetherston, Anne Fetherston and Mary Fetherston, all married and had children. The Fetherstonhaugh family continue to this day although they have moved from the places mentioned above. In 1838 Lewis writes “Bracklyn Castle (is) the fine seat and demesne of T.J. Fetherston Haugh”. Peter Bamford originally thought this T J Fetherston Haugh was Thomas John Fetherston, later 5th Bart. An email from admin at watercoloursfair.com advised on 18 Aug 2009 that T Fetherstone (Haugh) was not a baronet, none of the Irish Fetherstonhaughs were; that T J Fetherstonhaugh was Thomas James Fetherstonhaugh, not Thomas John; and he subscribed to Lewis's book as "Fetherston H., T. J., Esq., J.P., Bracklyn Castle, Kinnegad, Co. Westmeath". Ardagh House is now a domestic science college. Grangemore, south of Bracklyn at Ratharney, Co Westmeath, is now a ruin. Derrymore near Rathwire, Co Westmeath was left by Oliver Nugent to the Fetherston family but by 1814 it was ‘the seat of Captain Daly’ (Lewis). It also is now a ruin. Carrick was still a Fetherston property in the first quarter of the 1900 when Francis Berry Fetherstonhaugh was living there.